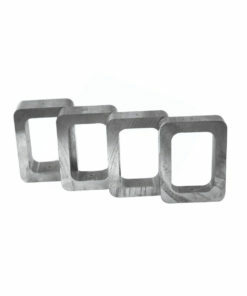 Aluminium Mould Frames – Aluminium Frame 47 X 73 X 25 from Durston Tools. Durston Tools’ Aluminium Mould Frames are precision ground with perfectly parallel surfaces. This frame has a 47 x 73mm internal size and a width of 25mm. Durston’s Aluminium Mould Frames are precision ground with perfectly parallel surfaces. This frame has a 47 x 73mm internal size and a width of 25mm. Weight 0.25kg. Like all of Durston’s tools, they are designed to provide a lifetime of reliable use in any professional jewellery workshop. Part of Durston’s award-winning product range available since 1961.